Philadelphia Flyers forward Michael Raffl celebrates his first goal against the Detroit Red Wings. It was clear from the start that this wasn't just another of 82 regular season games for the Philadelphia Flyers. Entering play just three points behind the Detroit Red Wings -- their opponent on Tuesday night -- for the final Eastern Conference wild card spot, Dave Hakstol had his team ready to play when the puck dropped in South Philly. And that may be an understatement. Thanks to two goals from Michael Raffl, a first period in which they outshot their opponent by 20 (23-3) -- and more importantly outscored them (2-0) -- and some highlight real saves by Steve Mason, the Flyers (33-23-12) inched closer to a playoff spot with their 4-3 win over Detroit. • The Flyers got off to a hot start Tuesday as they not only put up 23 shots in the period (a season-high), including 16 in the first 10 minutes, but also held the Red Wings to just three. I'm not sure which number is more impressive, but the fact that they happened in the same period against a team ahead of them in the standings (and so late in the season) is the biggest thing that jumps out at me. They also held Detroit without a shot for nearly 10 minutes. According to Elias, the last time the Flyers put up 23 shots in a first period was back in 1984; the last time they outshot their opposition by 20+ in a period was in 1982. • Raffl (11) and Wayne Simmonds (25) got the scoring started for the Flyers in the first period. And with eight minutes gone by in the game, the Flyers had more goals (2) than the Red Wings had shots (1). First, here's a look at goal No. 1 for Raffl, which was just a beautiful move by the 27-year-old forward. • They were able to avoid the pitfalls of the ever-dangerous two-goal lead. Twice in the second period the Red Wings were able to cut it to a one-goal Flyers lead, but both times the home team was able to answer. First, it was Raffl (12), who got his second of the night. It was the second two-goal game of his career, with the other also coming against the Red Wings on Oct. 25, 2014. Then, after Detroit (Datsyuk) made it 3-2, Shayne Gostisbehere scored his 16th of the season. Shockingly, it was just his first goal that didn't tie the game or change the lead, but given the importance of the game -- coupled with the situation -- it may as well have. • The Flyers were 0-for-6 on the power play, which included 55 seconds of a five-on-three in the first period. But it wasn't for a lack of trying, as the Flyers had 10 shots on those power plays and more than a few chances. They're clearly missing Jake Voracek on that unit. The first Flyers penalty of the night came at a pretty bad time, with Giroux heading to the box midway through the third. The PK unit did a nice job killing it off, but that was hardly the end of the danger. They finished 2-for-2 on the kill, but the second one was only about 30 seconds long. 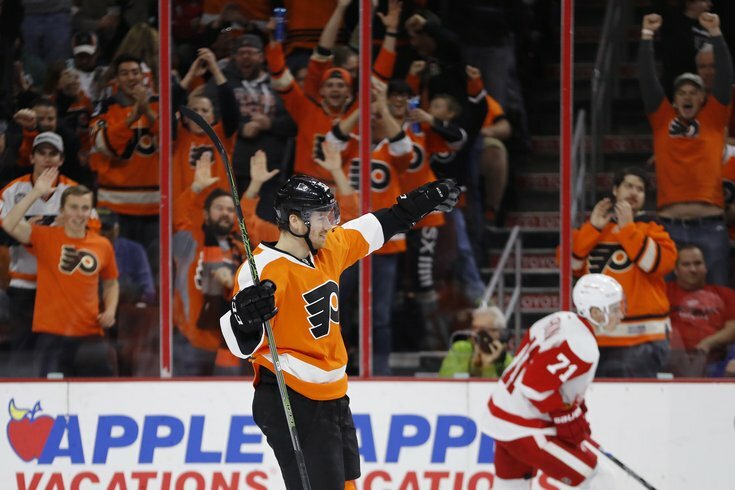 • The third period was hold-on-for-dear-life time for Flyers fans, as the Red Wings nearly drew what was once an absurd margin in shots to even. Not only did Detroit cut the lead to one, hit a post and outshoot the Flyers by 12 (21-9) in the period, but they also forced starting goalie Steve Mason to make saves like this one late in the game. It may have been the Flyers forwards who got things started for the home team on Tuesday night, but it was Mason who brought home the victory. In all, he stopped 34 of the Red Wings' 37 shots, including 20 of 21 in the third period. The Flyers will now head to Chicago where they'll take on the Blackhawks on Wednesday night. They'll then return home to host the Pittsburgh Penguins on Saturday at 1 p.m. in what promises to be as intense as their win over Detroit.